TAPNET Brochures, Postcards and other Swag Stuff TAPNET has a number of brochures, postcards, swag stuff and other promotional material already created. We will be adding them on this page as we can so you can order them directly for your own promotional use. 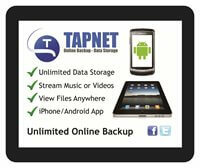 If you have a physical presence with your clients and would like to offer them a brochure or other promo stuff to help promote TAPNET Online Backup view and order some items below. We create all our stuff using Vista Print and ship the items to you. We can also create custom URLs for your Affiliate Link and customize promotional material to contain your URL. For example, we can create a sub-domain called yourcompany. and have that forward to your affiliate link code. This helps ensure you get commissions on referrals from promo material such as brochures or postcards.